Information provided courtesy of the Anchorage Chamber of Commerce. Anchorage is located in a region referred to as Southcentral Alaska and is easily accessible by air, land and sea. Anchorage is often the first stop for many visitors to this great state. Almost half of Alaska’s residents live in this area surrounded by miles of coast, mountain ranges, hundreds of lakes and rivers, glaciers, ski resorts, excellent fishing and recreational opportunities and nearly 20 state parks. Anchorage is a fantastic place to live, work and play. 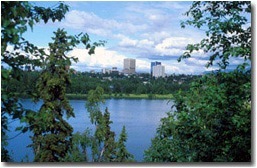 While misconceptions of a frozen land filled with wild animals, igloos and continuous dark, cold nights abound, Anchorage boasts a strong and diverse economic base, affordable living, excellent recreational activities, top-notch education and health care facilities, low taxes and cultural and ethnic diversity. Hundreds of people annually choose to make Anchorage their home. Quality of life in Anchorage is an added benefit for those looking to do business in the city. Anchorage's 265,000+ residents live in a vibrant, modern city that offers an exceptional array of leisure activities and city services while surrounded by unsurpassed scenic beauty and recreational resources. Denali National Park, Kenai Fjords National Park and the Chugach National Forest are all within a few hours of downtown Anchorage. In 2003, Alaska Pacific University was recognized by Backpacker Magazine as offering a top educational experience with easy access to an abundant number of outdoor recreation opportunities. There are more than 200 miles of paved and un-paved trails in the Municipality of Anchorage used for hiking, walking, biking and other recreational uses in the summer. In the winter more than 130 miles of walkways are plowed and 100 miles of ski trails are groomed for public use. There are even 36 miles of trails dedicated to the state’s official sport: dog mushing. In 2002, Anchorage received the distinction of being one of 10 cities nationally to be named an “All-American City” by the National Civic League. This is the fourth time Anchorage has received the accolade; the city was first named an “All-American City” in 1956, and then again in 1965 and 1984. This award recognizes the “spirit of grassroots citizen involvement and cross-sector collaborative problem solving” displayed by Anchorage residents. Programs that contributed to the award in 2002 were Bridge Builders, an effort to make Anchorage the first city in America without prejudice; the 2001 Special Olympics World Winter Games Alaska which utilized the assistance of more than 8,000 community volunteers to host the second largest event in the world that year; and the numerous quality partnerships formed through Anchorage Youth Court. In 2009, Anchorage was voted the No. 1 city in the nation to move to during economic hardships.